The ownership of UK audit firms should be relaxed to permit new capital to enter the industry to boost competition to the Big Four at the upper end of the market, according to a former chief executive of the UK’s audit regulator. Housing policy is too concentrated on first-time buyers and should be refocused towards ‘last-time buyers’ to encourage those aged 55+ to downsize, according to a new report for the Centre for the Study of Financial Innovation (CSFI). Raising the UK state pension age is not enough to address the challenges caused by an ageing population. 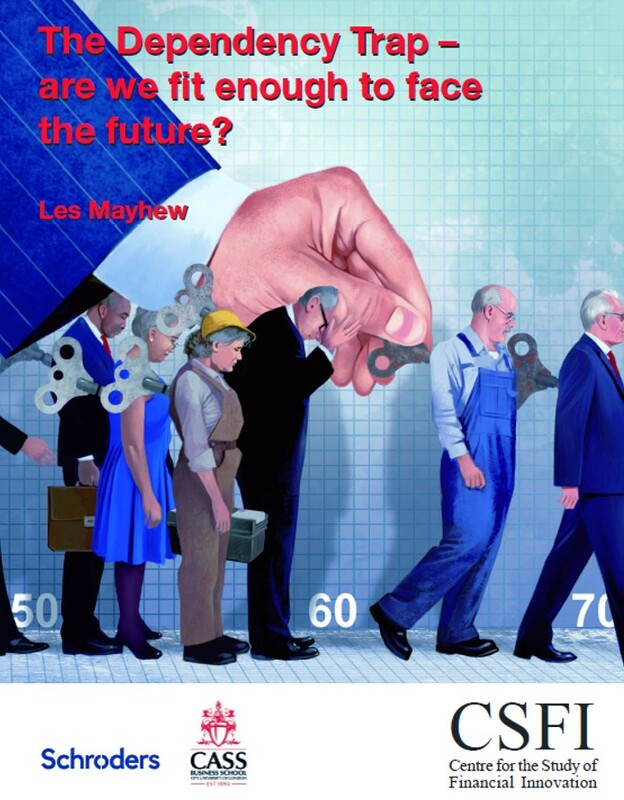 The UK Government should instead support an ‘active ageing’ environment, which would improve health and economic activity among those aged over 50, according to our latest report - by Professor Les Mayhew of Cass Business School. The explosive growth of new sources of finance for small businesses over the past five years represents a revolution in choice for borrowers and in investment opportunities for individual savers. But the challengers remain just that compared with the dominant market share of the big banks, and mass-market investment in these alternative assets is in its infancy. Davis suggests that in response to these pressures, hybrid models will develop. Established direct lenders will increasingly use P2P platforms to syndicate their loan books into the retail market; P2P firms may, in addition, start to deploy their own balance sheets, like a bank (which will increase their profitability), or run collective investment schemes, like an asset manager. In other words, the boundaries between established and alternative providers of funds for SMEs will become more blurred, and the sources of those funds will expand to include a wider universe of investors. This report, by our Financial Inclusion Fellow Christine Allison, is the most comprehensive survey of what is going on in the battle against financial exclusion in the UK to have been published in recent years. It includes an important foreword from Sir Hector Sants (who now chairs the StepChange debt charity), as well as contributions from, among others: Sir Sherard Cowper-Coles, Russell Hamblin-Boone, Rob Shearing, Rev Dr Malcolm Brown, Matt Bland, Kenny MacLeod, Gareth Evans, and Mick McAteer. How are we (that is, the UK, and more specifically the City of London) going to handle the Commission, the Council and the Parliament in the run-up to (and beyond) our exit? This report, written by our Brussels Fellow, addresses how the City should engage with the EU as the UK itself disengages. This report, which marks the culmination of the PIC/CSFI Pensions Fellowship, focuses on work-based pensions in the private sector - and, within that, on the new "auto-enrolment" regime for mass retirement saving. This report is based on a survey of opinions on Brexit, drawn from the CSFI's extensive network of practitioners, regulators and observers. The survey received 408 responses and the result was pretty overwhelming: nearly three-quarters would vote to stay in the EU in the event of a referendum. 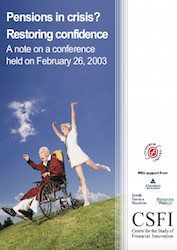 A booklet produced to accompany the CSFI's 21st anniversary celebrations. He Ying's report is a quick snapshot of the banks incorporated in China and operating in the UK. The paper concludes that there is enormous scope, and they are steadily improving their business models and enlarging their offering. With the financial services industry contracting and tighter regulation here to stay, independent research providers need to demonstrate value creation and shift from being "nice to have" to "need to have". The case for young people to receive a better financial education has never been stronger. Most of the young people questioned in this survey found personal finance "interesting", yet 64% had not had any formal financial education. A compendium of views on the recommendations of the Independent Commission on Banking. 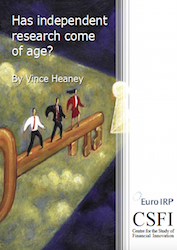 Has independent research come of age? Dealing commissions should not be used to pay for fund managers to have access to the clients of investment banks, according to a report on the independent research sector, which competes for a share of those commissions. Malcolm Levitt gives valuable insight into how UK firms might engage more effectively with the powers-that-be in Brussels, in order to best maximise their opportunities within the EU. Shirley Beglinger argues that Solvency II will shake up the global insurance industry as surely as Basel II shook up the banks. And with similar unintended consequences. An investigation into the various legal, tax and business forms that characterize the increasingly complex world of social entrepreneurship. A pragmatic look at the post-crisis regulatory reform agenda, from the perspective of an experienced regulator. John Kay makes a powerful case that we are in danger of drawing the wrong lessons from the financial crisis. The road to redemption for UK banks. The report sets out a new way to measure financial well-being and recommends that banks adopt a new set of tools that would help customers control their debt and improve their money management. A leading UK economist’s thoughts on resolving the current crises. Is the Internet helping to redefine economic activity, or is it just another channel? Did the bursting of the dotcom bubble in 2000 bring an end to the hype and overvaluation of internet companies? Or was it just a pause? An antidote to regulatory prescription. The report of the CSFI Working Group on Effective Regulation. What this paper does is point out something that is (probably) obvious to most insurance professionals, but which doesn’t easily percolate through the wall between insurance and the rest of the financial services industry. It is that insurance is so different that it needs different, indeed bespoke, accounting rules, just as much as it needs its own, bespoke, regulatory rules. A bold proposal to render debt legally unenforceable that was extended to borrowers who were clearly in no position to repay the debt. Regulation of the Non-Life Insurance Market: why is it so damn difficult? An appeal for caution as regulators set about putting the square peg of insurance into the round hole of banking-type regulation. A summary of the discussions held during a one-day pensions conference. Proposals for improving the system of auditing large company financial statements. There are at least fifty trade associations representing City interests. Do they provide value for money? A report inspired by a working group on the regulation of financial advice in an era of personal financial responsibility. Clearing and Settlement: monopoly or market? Introducing greater competition to the clearing and settlement of cross-border FX transactions. A review of six major studies on boosting private sector investment in UK SMEs. A collection of essays stemming from a seminar on Basel II held at the FSA in 2001. A proposal for unbundling the national market for equities and reconstituting it as a series of local markets run by franchisees. Professional bodies can lead the banking industry’s efforts to reclaim professional standards – but only if they have greater employer recognition and credible teeth. International regulators risk losing a sense of perspective by extending to the insurance industry, in blanket fashion, post-crisis measures designed to deal with financial instability. 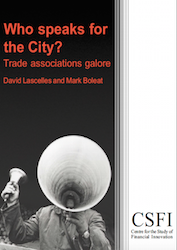 Batting for the City: do the trade associations get it right? The first comprehensive review for a decade of financial trade associations based in the UK has found that a few big mergers have been offset by the creation of associations in innovative sectors. The first comprehensive survey of one of the fastest-growing financial sub-sectors in the UK. Charles Taylor argues that financial systems are textbook examples of systems that change and develop according to the (relatively simple) rules of evolution. Mark Napier suggests that innovation by mainstream banks and the mobile phone industry will play a greater role in the future in building financial inclusion rather than in traditional microfinance. In this frank report, Peter Morris raises serious questions about the way private equity returns are measured, fees and incentives, and the diligence exercised by “sophisticated” investors in private equity funds. An important paper on the appropriate regulatory structure for dealing with systemic risk caused by failing financial institutions, including the proposal that there should be a Systemic Policy Committee (SPC). 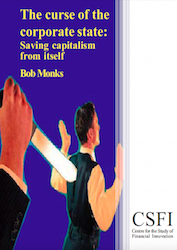 Unlike many other books on the crunch, this one sidesteps the nightmarish stew of strange financial practices and derivatives that led to the crisis. However, there is still a serious point to The Credit Crunch Diaries. Before the crisis, bankers, like Gershon, were pulling in one direction, and regulators, like Parquet, were pulling in the other – but when it came to the crunch, both somehow turned out to be wrong. This book is a witty and sometimes bitingly satirical portrait of that failed relationship. In "'Twin Peaks' Revisited… a second chance for regulatory reform”, Michael Taylor has refined the argument to tackle the problem of “too big to fail” institutions. Read the original report - "'Twin Peaks': a regulatory structure for the new century". A report analysing the systemic causes of the crisis and suggesting reforms that are an antidote to the current “more of the same” trend. An anthology of insights into the present crisis by leading figures who grappled with previous ones. Informal Money Transfers: economic links between UK diaspora groups and recipients "back home"
This report has been produced with support from the Esmée Fairbairn Foundation. The author is David Seddon, Professor of Development Studies at the University of East Anglia, and one of this country’s foremost experts on diaspora communities. This is a paper that sets out to explain why insurers have had such little joy out of the Basel II experience - despite the fact that it was widely assumed that insurance would provide a cheap and effective mitigant for operational risk. City experts who lived through Big Bang discuss the lasting impact of the de-regulation of London’s securities markets. Sponsored by Clifford Chance. Replace the current state pensions with a single residency-based pension, administered by an independent non-political body. 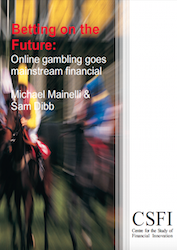 Online gambling has disintermediated the middle-man and introduced real market discipline to the gambling area. Shareholder activism is the antidote to"corpocracy". More and more FX business will gravitate towards a small group of institutions who have the volume to compensate for wafer-thin spreads and the resources to invest in processing technology. A proposal to relegate most of the detail of Basel to technical appendices in the EU implementing Directive (where they would be easier to amend), leaving the general principles of Basel for the main body of the Directive. A regulatory model that focuses on the outcome of good risk management - solvency - and not on the minutiae of how risks are managed. Solutions for tackling a systemic problem with corporate governance. A proposal for a new type of fund that provides a way through the labyrinth of poor value advice for retail investors. Is there really a market for a derivative product that is specifically focused not on a class of assets, but on a single security? A look at the concerns voiced in the City regarding the FSA's new risk-based unitary regulatory structure. What will the privatisation of the UK's premier aid agency mean in practice?